Texas-born Audie Murphy, one of the most decorated combat soldiers of World War II, was especially cheered as a hero in his home state. That Lone Star pride was key to the neophyte actor landing his first movie lead in Bad Boy, a sturdily made profile of a tough-as-nails delinquent inspired by Variety Clubs Boys Ranch case histories and backed by Texas theater owners who championed Murphy. The future star of 40 movies (including The Red Badge of Courage, The Quiet American and The Unforgiven) plays repeat offender Danny Lester, serving time for a botched robbery and chafing to escape. Boys Ranch caretakers Lloyd Nolan, Jane Wyatt and James Gleason try to set Danny straight, while fellow juvies Stanley Clements, Jimmy Lydon and Dickie Moore try to put the antisocial hothead in his place. Released just as Murphy's war memoir To Hell and Back was climbing best-seller lists, Bad Boy shows us the troubled soul behind a babyface - and the star charisma that put a battle-hardened veteran on track to becoming a Hollywood icon. 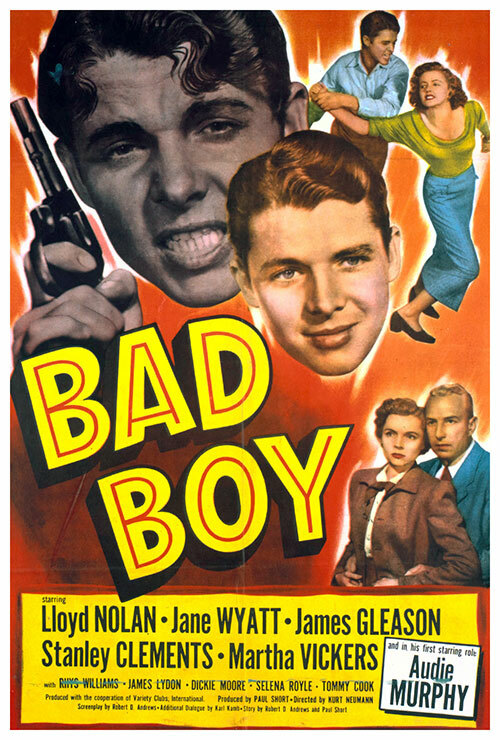 1 Response to "Bad Boy (1949) Kurt Neumann "
Cool! I had been looking for this one for awhile. Glad to see it turn up here! Thanks!